YOUR MAMAS NOTES: There are few Tinseltowners Your Mama is more fascinated by–and fearsome of–than the famously tempestuous showbiz she-devil that is Sharon Stone (Bobby, Casino, Basic Instinct). The naughty bits-baring Oscar-nominated and Emmy-winning (The Practice) actress, indefatigable AIDS activist, single mother of three, and one-time Miss Crawford County has owned the same Beverly Hills, CA mansion since way back in 1995. None-the-less we've had numerous occasions to discuss Miz Stone and her real estate activities. In the turbulent aftermath of her 2004 divorce from to San Francisco newspaperman Phil Bronstein–they owned a spectacular cliff top mansion in the San Francisco's wealthy Sea Cliff enclave–Miz Stone developed some ants in her real estate pants. In March 2006 the sometimes acerbic and often controversial actress spent $10,995,000 for a new crib in Los Angeles to call home. She selected a walled, gated, and secluded estate tucked up in to the tail end of a rugged, celebrity-lined canyon in the Post Office area of Beverly Hills. Alas, the mercurial M.I.L.F. quickly had a real estate change of heart and withing months flipped the large, lavish an architecturally undistinguished mock-Med mansion back on the market with an asking price of $12,500,000. Since then Miz Stone has had the property on and off the market at least 5 times with increasingly lower asking prices. Your Mama first discussed the property in December 2006 and since then have yakked and rambled on about it a number of times including in June 2007 when it was re-listed at $11,500,000 and again in April 2008 when Miz Stone made it available as a high-end lease with a monthly rent of $58,000. We last yammered on about Miz Stone's real estate white elephant in February 2010 when she once again re-listed (and then quickly de-listed) the sprawling property with an asking price of $8,995,000. 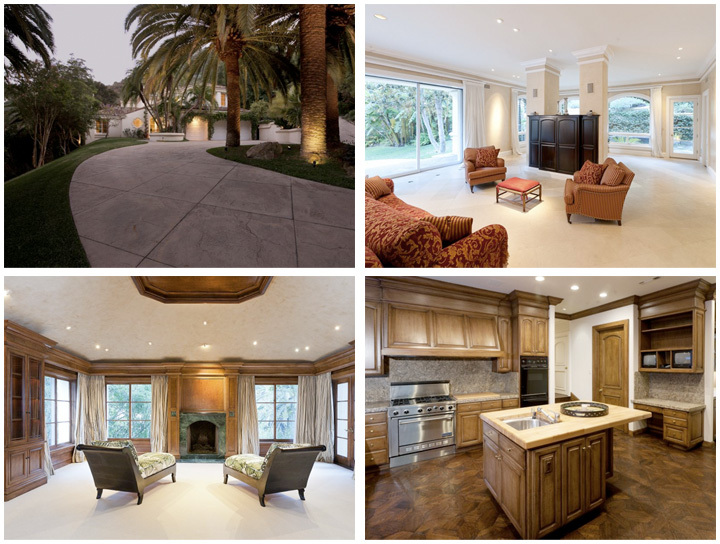 Miz Stone, bless her unlucky real estate heart, has once again climbed aboard the celebrity real estate merry-go-round and recently re-listed the estate with the familiar asking price of $8,995,000. If Your Mama flicks and slides the beads of our bejeweled abacus we calculate that even if she and her Real Estate manage to secure a full price sale Miz Stone faces a punishing $2,005,000 loss not counting carrying costs and real estate fees. Your Mama has already dissected, dissed, and discussed Miz Stone's unwanted estate in Beverly Hills multiple times so we just can't bear to work it over again. Therefore just the basic 411 will suffice here and should iffin any of the children care to read more they can check out one of our several previous analyses of the property. The property spans 4.85 hillside acres, offers garage parking for upwards of 14 cars, and includes 5 bedrooms in the main house and another 2 in a detached guest house. Listing information shows there are a total of 8.5 bathrooms. In addition to guest quarters the guest house also contains a state-of-the-art media room and gym. The rambling grounds and outdoor entertainment areas include a side patio with built-in barbecue station, resort style-swimming pool and spa, lighted tennis court with viewing pavilion, and meditation garden and meandering pathways with bridges and waterfalls. 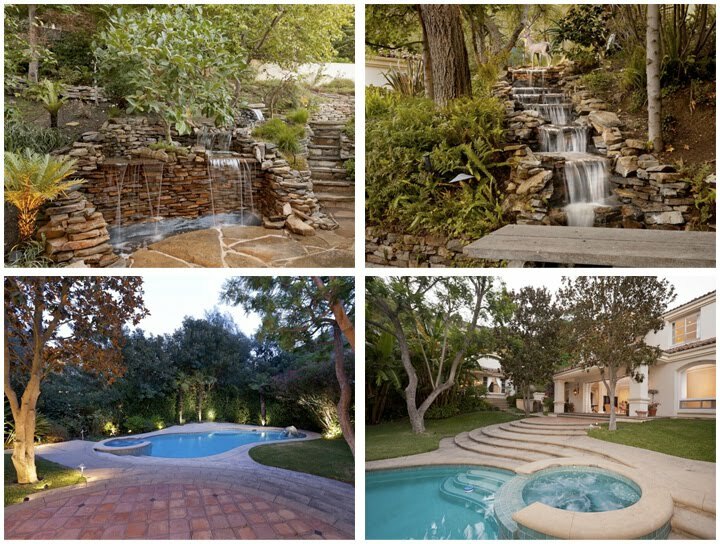 Some of the other high-profile property owners in the area include Eric Dane (Grey's Anatomy) and Rebecca Gayheart, country queen Taylor Swift, and buff-bodied actor Jesse Metcalfe (Desperate Housewives, Chase). As it turns out, listing her unwanted estate isn't the only (tabloid) news Miz Stone is making this week. Gossip juggernaut TMZ reported this morning that after hearing suspicious noises in her slumbering Beverly Hills mansion–the one she lives in, not the one that's for sale–Miz Stone phoned the po-po at 2 a.m. concerned that someone had busted up in to her house. Turns out there wasn't an intruder or or any sign of a break in. However, better safe than sorry for Miz Stone who has long been a magnet for sickos, stalkers and assorted moe-rons who seem to think its a good idea to bang on her gates and ring on her bell. The worst staging I have ever seen. And the photos!!?? Better to just leave it empty. She must have been emotional from the divorce when she bought this pile. Property has regret written all over it. Its one of those properties that is probably a tear down due to the large private lot, but is priced too high to make that happen. The issue with this house is that looking at the front, its hard to ignore the fact that it looks oddly like many other homes... and by that I mean tract homes that go for 1/10th of the price (1/20th in some cities). Its one of the least imaginative designs for BP, and there are lots of unimaginative homes in there! HOT MESS just likes it OWNER! I keep seeing Sharon driving all over town (even at night) in her black Bentley GT with the top down trying to get attention... quite pathetic actually. Beautiful home, I'd love to live in it! It's the worst kitchen sink placement I've seen in a long time. What a bunch of jealous idiots. I'm not sure how you can look at this place and NOT remark on the beauty of it. Don't hate something just because it's owned by someone you clearly have issues with.